My boss recently got our entire team a set of Evernote Moleskine notebooks to enhance our note-taking and info sharing practices. I’m not usually one for carrying paper around because I prefer to keep my notes digital (and therefore searchable), but now that I’m handling larger projects, I’m finding a hybrid system of typed notes and handwritten diagrams also works really well. After years and years of using exclusively digital notes, I’m ready to give analog tech a try. That’s why I find the Booqpad for iPad Air, a folio hybrid that includes a 50-page pad of paper, such an interesting product. I reviewed the first version of the Booqpad years ago, but I didn’t really like it because it was missing any ability to position the iPad in different viewing modes. The Booqpad for iPad Air takes a much more modular approach. The Air is placed in a plastic back cover, which adds protection and a set of magnets that can cling to the rest of the case. The folio portion of the case is completely detachable, right down to the 50-page pad of paper. 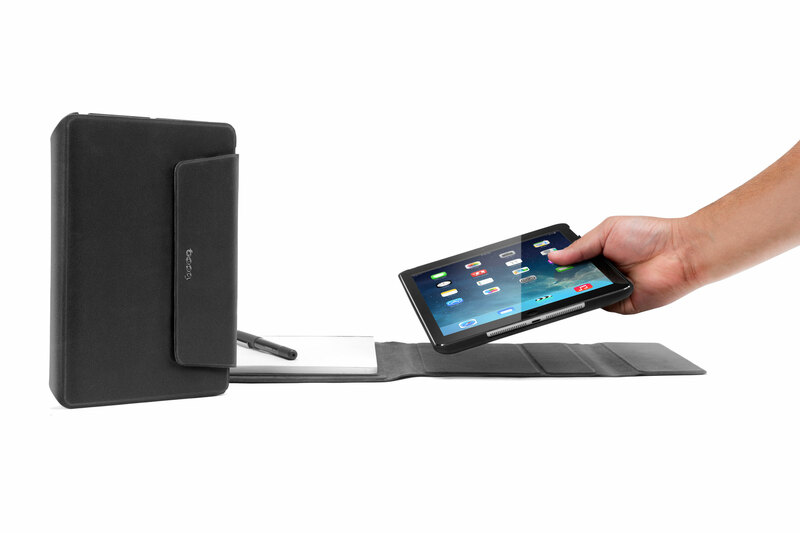 This gives you the flexibility of being able to carry around an iPad and paper pad around in one package, while still allowing you to lift the iPad right off the table, as if it were a standalone device. The Booqpad for iPad Air looks like a really sleek and clever take on an iPad folio, and it doesn’t break the bank either. It’s $60 up front, and $10 for a 3-pack of paper refills.